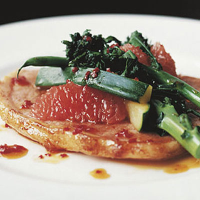 A sweet tangy dressing makes a perfect contrast to the saltiness of the succulent gammon steaks. Preheat the oven to 200°C, gas mark 6. Halve the broccoli stalks and beans lengthways. Cut the courgette into chunky sticks. Put the beans in a steamer over a pan of simmering water and cook for 2 minutes. Add the broccoli and courgette, and steam for a further 6-7 minutes or until just tender. Meanwhile cook the gammon. First, sprinkle the five spice powder over the gammon steaks in a roasting tin. Dot each with a little butter and bake in the oven for 15-20 minutes. Cut away the skin from the grapefruit. Working over a plate to catch the juice, cut out the segments from between the membranes. Add the grapefruit segments to the vegetables and remove from the heat. Using a slotted spoon, remove the gammon to warmed serving plates. Add the chilli, honey and grapefruit juice to the juices in the pan. Heat until bubbling then stir in the vegetables, tossing them until lightly coated. Pile generously over the meat and serve with the pan juices spooned over.